Dwarf of Thorin & Company. Dwalin, son of Fundin, was born in 2772 of the Third Age. His older brother was Balin. Their familiy was of the line of Durin. 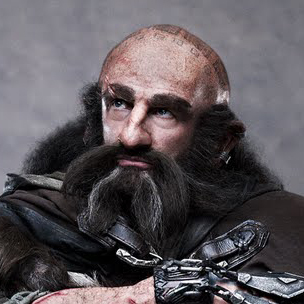 Dwalin had a blue beard and bright eyes. He wore a dark green hood and he played the viol. In 2841, Thorin Oakenshield’s father Thrain decided to try to reclaim the Lonely Mountain from Smaug the Dragon. Dwalin and Balin were among the Dwarves who went with him. They were pursued by the minions of Sauron, who sought the Ring of the Dwarves borne by Thrain. One night while camping in the eaves of Mirkwood in 2845, Thrain was captured and taken to Dol Guldur. Balin and Dwalin and the other Dwarves sought him in vain. One hundred years later in 2941, Thorin renewed the quest for the Lonely Mountain, and Dwalin was chosen as one of the twelve Dwarves to accompany him. Dwalin was the first Dwarf to arrive at the home of Bilbo Baggins on April 26, and he sat down for tea with his host until the others arrived. Afterwards he helped clean up the dishes. When Bilbo embarked on the quest the next morning without a hat, Dwalin lent him a dark green hood. After Bilbo rescued the Dwarves from the Great Spiders of Mirkwood, Dwalin was the first to notice that Thorin was missing. Later, when Bilbo helped them escape from the prison of the Elvenking using barrels floating down the Forest River, Dwalin was one of the worst affected by the journey. While they tried to find the secret door at the Lonely Mountain, Dwalin expressed his impatience with their burglar. Dwalin settled at the Lonely Mountain after Smaug’s demise and became prosperous. When his brother Balin led an ill-fated expedition to Moria in 2989, Dwalin remained at the Lonely Mountain. He was still living there at the time of the War of the Ring. On the genealogical table in Appendix A of The Lord of the Rings, Dwalin’s date of death is given as 3112. This is unusual for two reasons. Firstly, there was no such year as 3112 since the Third Age ended with the year 3021. (This date would correspond to the year 91 of the Fourth Age.) Secondly, this would have made Dwalin about 340 years old when he died, which is extremely old for a Dwarf. One draft of the genealogical table seems to suggest that Dwalin was 251 when he died, which would make his date of death around the year 2 of the Fourth Age.